It doesn’t matter if you have been playing bingo at your local bingo parlor for years, you might be thinking of giving bingo games online a try. Even if you still enjoy the social aspect of seeing and interacting with your friends at the bingo hall, there are some advantages to playing bingo online that you don’t get at live games. All you need to take advantage of the fun is a computer and an internet connection. 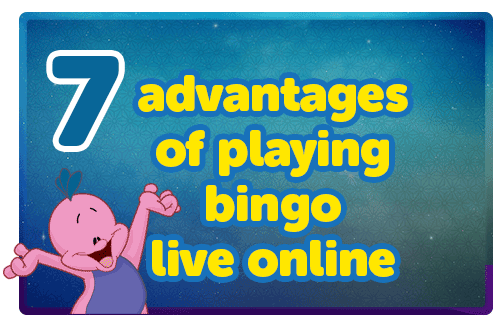 Here are seven advantages that playing bingo live in an online setting can offer. Playing Bingo Online is 24/7 – You don’t have to wait for your local bingo venue to open and the games to officially begin when you play bingo online. You can play any time of the day or night and on any day of the year. It’s nice to not have to get dressed, get in your car and travel to the nearest casino to be able to play into the wee hours. You can enjoy the fun of playing bingo anytime you like right from the comfort of your own home. That means you can play bingo while dressed in nothing but your night clothes and your bunny slippers if you wanted to. Even when it’s 3:00 in the morning and you can’t sleep; it may surprise you just how many others are also up playing, too. Playing bingo anytime online allows you to work it around your schedule. Playing bingo online can be less annoying – Some of the real downsides of playing bingo are all of ‘the little things’ that go on at the bingo hall. There always seems to be someone who just gets on our nerves while we’re trying to focus on the game. Other players may have annoying habits such as being too talkative, or taking up an entire table on their own with all of their cards and assembled good luck charms. Other players may be just too loud or moan and whine aloud every time someone else wins. You don’t have to keep a constant eye on your cards to avoid interference from other players, and you don’t have to worry about being short-changed by bingo hall staff either. It’s also nice to not have to worry about having your clothes, hair and everything else smelling of cigarette smoke by the time you get home. Playing bingo online lets you avoid all of that. Once you get started playing bingo online, you may never want to go back to the bingo hall again! Playing online can be less expensive. Playing bingo live will often mean that you are buying a set number of cards for a set price. Online bingo will have a range of prices, depending on how much you want to try to win. Some feature free or very low prices for players who are risk averse. Those who want to spend more potentially have a chance to win bigger prizes. Many online players appreciate having that choice. Online bingo games are fast paced! Playing bingo is often considered to be very dull when waiting for the bingo caller to pull the numbers out of the hopper and read them aloud. The computer based Live bingo games online are more fast paced. The numbers are chosen by the computer and you don’t need a dauber to mark your cards, simply click them with your mouse. You can play bingo and chat with friends around the world – One feature of the best bingo sites online is the chat feature. You can still interact with friends who moved that you once knew at the bingo hall. In an earlier article, we asked whether our users liked to chat while playing bingo. We got a variety of interesting answers but the general consensus was that chatting with others adds to the fun and for some, it’s their favorite feature. Playing bingo online has more variety – In order to keep players interested and engaged, sites feature colorful graphics, sounds to keep it interesting. At BingoMania we have a variety of cards and different games as well as courteous and attentive staff on hand 24/7. Online bingo sites will often offer bonuses to players – Online bingo is a multi-billion dollar business each year and most will offer incentives to get people to join their site. At BingoMania, we have a number of different incentives for players to play such as our $10,000 Tuesday- Thursday free bingo sessions from 8:00p.m. – 9:00 p.m. or our end of the month Mega Prize Game. That’s just a start, of course. You can check out more of our latest promos here.